Step 1. Using your curling iron, curl all over, being sure to direct the curls away from your face. Spritz with hairspray. Step 2. Determine the placement of your headband and slip it over the crown of your head, pin into place. Step 3. Starting from the front section, begin twisting and tucking sections of hair up and over the headband, it should start resembling a crown. Step 4. Continue twisting and tucking, being sure to fill in any gaps. Step 5. 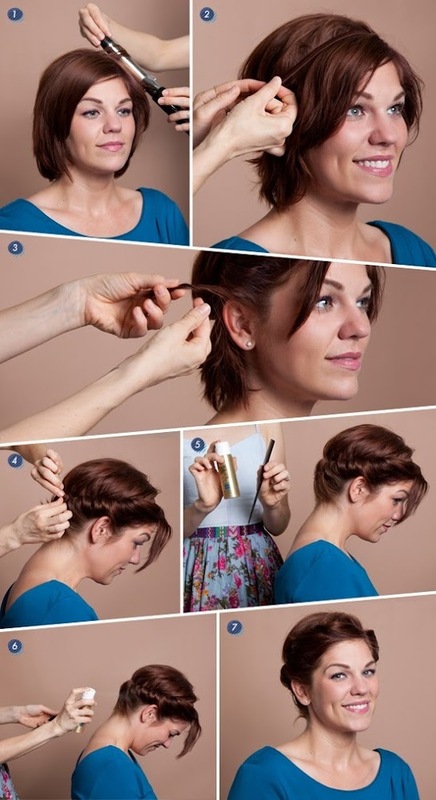 If you have very short hair in the back, use your comb to hold the hair in place while you blast with hairspray. Step 6. Set the style with hairspray.